questions and more, then vote the best to the top. an integral part of your stream. Chat can get busy, and important questions and ideas can scroll past without you ever seeing them leaving your chat to feel ignored. Showbot gives your chat a place to sumbit their ideas and qustions so you can quickly and easily view them. Showbot integrates with a chatbot, such as NightBot, Streamlabs or many others, and allows your fans to submit show titles, quotes, song requests, ideas, questions or anything else you can think of, then lets anyone vote, bringing the best of the best to the top. 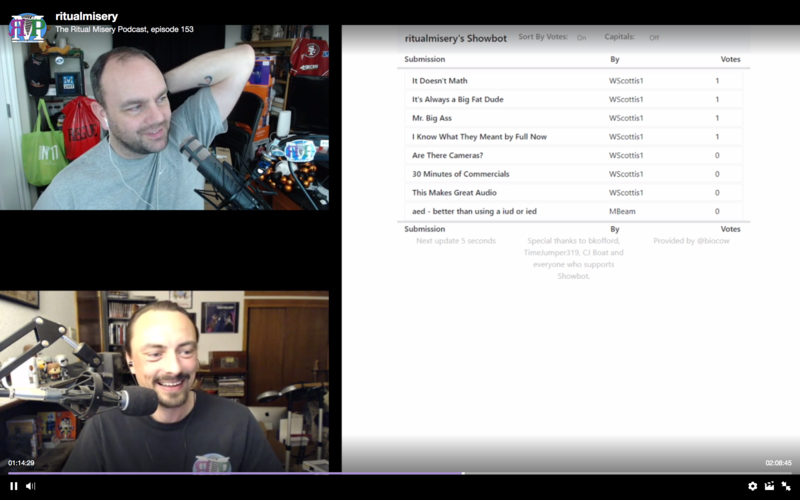 Showbot was originally built to collect possible episode titles for live recordings of Podcasts. After the show, everyone could vote on their favorite title and the hosts would choose one as the title of that episode, often the crowd favorite. But Showbot can be used for any number of things. Have a guest on for a Q and A? Use Showbot to collect questions. Do you stream live music? Collect song requests. Even if you're a gamer, ask your chat what game you should stream next and let them vote on the results. Figure out new and unique ways you can use it for your stream. 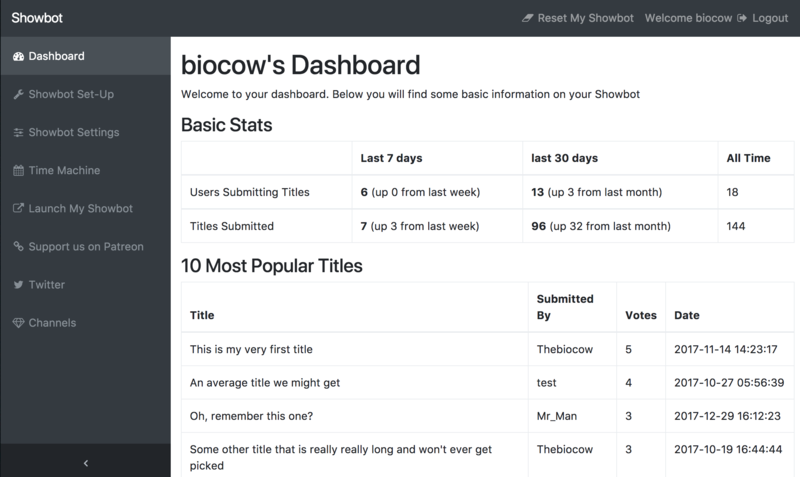 Showbot keeps important stats and figures which you can view on your Dashboard. Which of your followers submitted the most titles? What was your most upvoted title? These stats and more are available on your Showbot Dashboard. You can also go back in time and view a past list by choosing a specific date. Reset your Showbot with the click of a button. Showbot can be up and running in just 5 minutes. Nothing else can make such a difference in the way you stream so quickly.